Bloodshow | Vault Of Evil: Brit Horror Pulp Plus! In one brain-shattering second the girl´s logic deserted her, hurtling her into the black depths of sheer terror. Her mind exploded at the height of her scream. And all that remained was an inborn instinct to flee blindly. You know when you are reading GNS This is from 1987. The dungeon of the old castle near the Lochside hotel in the Highlands is made up as a horror tour. There is a vampire, a werewolf and a torture rack. Honeymooners Kim and Eric Armstrong are both horror-fans, so they stay. There aren´t much guests at this time of the year, only old man Vallance, who is writing about haunted castles, and freelance journalist Caroline Chadderton, who visits the dungeon at night and dies horrible. Seems the old Laird of Benahee was an evil man, who was hacked to pieces by his peasants, and now he is back for vengeance. The death-toll mounts, and at the end all guests are grounded because of a hurricane while poor Kim and Eric must battle the forces of darkness with the help of medium Ursula Illingsworth who comes to the rescue. Also there some fine evil mindgames one of which concerns a hallucinated suicide in a bathtub with a razor (which the cover illustrates nicely, even if the razor is missing) and an evil baby crying for milk - and getting it. Thanks to this review - when I ran across this book yesterday it went in straight my trolley ( so to speak) - so kudos Andy! I also finally found Demons which I've wanted to read for awhile , even though it's not highly regarded as the sequel to the excellent Deathbell. Also snagged The Resurrected - another gap filled in my GNS shelf. Demons is a decent novel in its own right...just nowhere near as good as Deathbell. The Resurrected is extremely scarce these days. I remember it came out around the time the wheels were coming off the Maxwell empire - it wasn't easy to come by even when recently published. I had no idea The Resurrected was scarce - just figured it was *another* GNS I was missing. Here's the cover anyways. The one and only time I have ever seen The Resurrected other than on ebay or in a specialist shop was when I bought my copy new. I'm probably going to read Demons next as I've not read any GNS after plowing through 6 in a row - Werewolf by Moonlight, Return of the Werewolf , Son of the Werewolf , Wolfcurse , Caracal and Sabat: the Druid Connection. 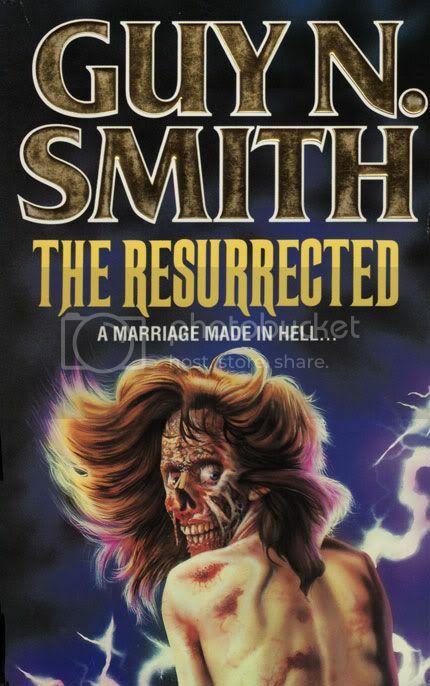 I'm really chuffed about The Resurrected - I hardly ever find scarce books! Whilst tackling The Books of Blood so I can contribute my vote to Dem's poll ( halfway through volume 3 ) I thought I would break it up by reading a GNS. Bloodshow was screaming back at me as I haven't read it since it first was published way back when, and I had completely forgotten the story. Well it is as stated above not one of his very best. A number of things enlighten it for me though. The ridiculous plot for one. An old decaying castle that doesn't seem to be supervised by anyone next to a modern Hotel. Guests can just go wander about in the dungeons and battlements with ease. The death of the two poachers made me laugh, they pick up some bit of skirt with a big arse walking along the road at night, and she forces them to drive into the Loch. Ok shes a phantom of sorts, but the locked doors and faulty break line etc, brilliant, although I could have done without the dog drowning. As for animal cruelty though it was good to see that little sadist get his neck stretched. The Sauce is subtle this book. The young receptionist gets of with a phantom barman, but she gets spiked on the torture wheel for her efforts. And the young sadists Mother gets a quickie of a tourist passing through the Hotel. But all is written in quite a restrained way maybe Guy was a bit off that week. The Vampire, Werewolf, The Torturer a Cannibal and and Executioner all make appearances. The Cannibal part in particular is a standout. And its these little parts of the book that gave me a reflection to Laymons The Cellar/Beast House books. You know. The old tourist attraction with morbid dummys and corpses to behold. Also when they come active it reminded me of the old 80s horror film Waxwork. Remember that ? The ending is rather bland, and the evil is vanquished in a simple and hurried kind of way. And you know damn well if a novel mentions a forthcoming storm or hurricane, you know its going to play a pivotal part in the final proceedings. And finally what is it with that opening first chapter ? It has no semblance to the rest of the book, its never gets referred to nor do we get a character from it returning. Its not even a Prologue . Is it just perhaps in there so the book could be called Bloodshow ? After reading this again I've decided to revisit a few more of his books again. Although its not his best, you always end up having a good time with his stuff. Might have a bash at Alligators next I think. Bloodshow begins where many novels end. A white gowned maiden flees up from castle dungeons, vampire count in pursuit. They reach the battlements, he catches up with her, agony! ... And then actor Leon Fayle is standing around dazed, with a sore jaw and a tooth on the floor. Director Frank Svoboda is angry, just as Leon was starting to get this scene right he went mad and tried to do it for real. And poor co-star Angela, bleeding from the neck, is not unreasonably downright livid. But she agrees to stay for the last two days of filming and not to sue despite her misgivings. Then it's on to Chapter 2 and just the briefest nod is made to the previous in all the rest of the book. We meet Kim and Eric Armstrong, newlyweds and horror fans up to honeymoon at the Lochside Hotel. It's a modern place, but built on the side of the ruins of an old castle, whose dungeons have been turned into a spooky tourist attraction. A Torturer, a Vampire and more in their niches, dead and dying strewn about, a marvel of gruesome fakery. But soon, ah, perhaps not all fakery! Kim and Eric's fellow guests are ageing occult writer and messy eater George Vallance and bitter freeland journalist Caroline Chadderton. Both are here for the dungeons, though George suspects something more afoot. It's not long before the first of various "accidents", and matters mount swiftly. Also, just to make sure no one is too confused about what's going on, a couple of poachers have a spectral misadventures. Turns out these are the lands of the Laird of Benahee, and he's back to put things in order! There was plenty of potential in this one, not always realised. I was a little sad that no more was made of the first chapter, I enjoy film-making horror. All the mechanics, the different layers of artifice and imagination, reality and "real" horrors, shifting and buckling, merging and tearing. There are a couple of fun tricks in this line, but not really enough. Also not enough is made of the various dungeon dwellers. A couple are well described and put on a good show, but I really wanted more. While a number of unfortunates fall prey, only a couple are properly on page (the poachers meet someone else). Overarching all, Kim and Eric just aren't very inspiring heroes. Blandly likeable is about the best to be said for them, they aren't smart, heroic, thoughtful or terribly interestingly drawn. And, perhaps unsurprisingly, the ending is blunt and a bit soft. Still, I had a pretty swell time. Even if the first chapter is essentially irrelevant it does mean that things start fast, and it isn't long before they're going in earnest in the main story. There are a good deal of scare sequences and the chapters which don't have them still point to them as they briskly move the story along. The two standout deaths are most fine, mean (though one is richly deserved), grisly and painful and one even turns into a bit of a double whammy. The other scares range from tense (Alsatian menace!) to horrific (bath-time dreaming with razor!) and all sorts in between, and are well executed and mostly pack a punch. Plus there's an unexpected but pleasing bit of mischief going on, some blatant and I think knowing absurdity and cheery jabs at the audience. This kind of thing can be simply really annoying but here I found it quite charming and fun. GNS, fortunately is no post-modern hipster type. Also, Kim and Eric may not be all that but some of the supporting characters are pretty neat. And the ending, somehow, is sort of what you want. So it all works out. The flaws are notable, but they're balanced out, it's surely no classic but I read it fast with a good deal of pleasure. Recommended.